By now, you have either put a little of your precious savings into gold or you have thought about it seriously. With the advent of gold ETFs (technically a misnomer, they are not truly Fs) it has never been easier to buy and sell the stuff. And at around $1200 an ounce, gold is up an impressive 50% or so since the fall of ‘08 and has gained an annualized 12.4% a year for the past decade. Of course, for most investors, the fact that gold has done well lately is more or less the entire argument in favor of buying it. Subtle justifications are available, but, let’s face it, none of them are as powerful as the primal urge to join the party while you still can. But when you get down to it, gold is one the more peculiar investments out there. Although it is an exaggeration to say that it is a substance of no intrinsic value, it has several industrial uses and would undoubtedly have many more if it were not so expensive, gold lacks some basic characteristics of a typical investment. In particular, owning it promises no economic benefit other than the hope that you will be able to sell it later on for more than you paid for it. To be sure, that motivation is behind much conventional investing, but for most assets there is a background hum of economic rationale, a reason why somebody might want to own the thing even if it did not appreciate. That has not happened yet, and I am not predicting it in the near future, but it is certainly possible and that possibility pretty well undermines the role of gold as portfolio lifeboat. And for all the recent excitement, the long term trend for gold as investment of last resort is negative. On an inflation-adjusted basis the recent peak of $1257 is still below the $599 1981 peak, which comes in at about $1400 in today’s money. A goldbug would probably argue that being under the 1981 high means there is more appreciation to come. I take the view that even in a financial dislocation that is by most measures worse than that of 1981, gold turned out to be less popular. That does not bode well for the next time ‘round. And there is no shortage of ways to insure against meltdown. You could just short the market. ETFs are made for shorting. Or buy put options. Treasury bonds, particularly the inflation protected varieties, make good hell-or-high-water stores of value, and you get interest checks twice a year. Good lord, no. I’ve just about considered selling my wedding band. If I had the courage, I’d short the bejeezus out of GLD. It is the most painfully obvious speculative bubble going today. Interesting Post. One other reason that Gold holds “value” is that there is tremendous growth in the manufacture and sale of Gold Jewlery. In fact, 25% of global demand for gold is for Jewlery in India! It has a VERY interesting use in aviation. Gold can be pounded so thin that it becomes transparent, yet still conducts electricity and heat better than almost any other element. It is used in the windshields of some Jets as a de-icing element. Anyway….I agree with Craig. This is a BIG short, but I am also lacking courage for this short. As with all bubbles, the question is “how high can it go.” I’m not one to pile onto an existing bubble, though I still hold some producer stocks (silver, actually) and the high price has allowed them to rapidly ramp up production. The hedge argument seems to fall apart, since gold also experienced a large correction during, though somewhat delayed from, the last market crash. What do you guys think about Gold/Metals Producer Mutual Funds? –USAGX. It has a dividend. Keep < 6% of your portfolio. To tell you the truth, Buddy_Rick, I’ve never taken a short position on anything, and I doubt I ever will. It just takes too much intestinal fortitude: you have unlimited downside, but your gain is limited to the amount of your investment. That sort of thing gives me fainting spells. I express bearishness about assets by just not investing in them. What about the argument of gold matches inflation in the long term (look at the past 100 years) Gold has devalued less than the dollar. 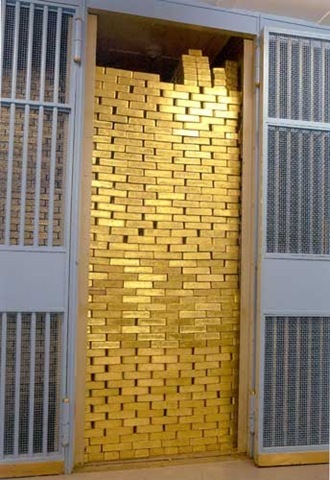 If gold is not worth anything why do central banks continue to own it? Is gold a perfect hedge against inflation? Definitely not. Should some be owned in your portfolio? For me definitely yes and no more than 10%. I don’t look at gold as investment, I look at it as an alternative currency. This is especially true as multiple nations devalue their currency. If owning any gold makes me a gold bug, I guess you have me pegged. The end is near. Time to get into my shelter and sleep with my gun. Well, Investor Junkie, it’s like this for me–Is gold, on the long-term, a good hedge against inflation? Yeah. It’s a pretty good hedge. But that’s just another way of saying the expected real return is zero. The Economist purported to run real gold prices back two centuries not long ago, and found basically a zero real return excluding the run up of the last few years; William Bernstein observed that an ounce of gold would buy a fine man’s suit in Shakespeare’s England, and it would buy a fine man’s suit today (well, maybe two suits at this very moment). But my thinking is, especially when I don’t expect any real return on an asset at all, price MATTERS. And I don’t like the price of gold today one tiny bit. I’d rather build a CD ladder that will not only track inflation fairly well, but is federally insured against a nominal loss. My expectation would be for gold to be trading close to its very long term historical norms by the end of this decade. But that’s just me talking, and I never claim my analysis is worth more than what I charge you for it! Um, yeah, what Craig said. I prefer to avoid buying high and selling low. Whenever it crashes, then I might think about buying some. @Kent: Correct but if you remember gold did less than the inflation rate in the 80′s and 90′s. I wonder if the reason gold isn’t doing as well this time around is because managers are using as a hedge more often and selling it to rebalance their portfolios. Also, just because an investment is bad doesn’t mean the general public will abandon it. Look at the durability of poor ROI collectibles. Money supply is increasing, debasing currencies around the world is on the rise. This is a fact. Gold holds value and it has been longer than the stock market been operating. The markets money printed out of thin air, sure the market surges where else is the money going to go. But realize all the dollars you think you’re getting are becoming more worthless. You may not like that the price of gold is going up. But the argument of return on investment is weak. You must be kidding me. All in all the reason for investment is capital appreciation. What’s the point of holding a stock if it’s price goes down but returns 7% dividend? Like buying a house for $300,000, collect rent every month for $1000, but after 10 years it worth $100,000. Gold is in a secular bull market cycle, you can’t deny it. You can convince yourself it’s not a good investment any way you can. But there are countries whole countries that believe otherwise, why do people buy, a number of reasons.. gold is a storage of wealth. Look at your bank account demonimated in US dolalrs. See what it’s worth in the world market. It’s becoming worthless. Do you like your storage of wealth now? The world does not revolve around the USD, this transfer of wealth is occurring. You are paying more for your goods. US depends on imports. How much more are they going to pay for things when it comes time, with USD that are devalued. to my understanding you can buy gold just like a stock you might not see the stock certificate but you have documentation saying that you own the stock. Similar with gold i don’t know anyone who has gold bars at their house. but i do know people with gold chains and the option of gold. When you buy Apple you own $12 dollars in profit? Interesting, can you go to apple and ask for that money every year? There is no difference between stocks and gold, you just have to find a bigger fool to take it off your hands. I am not a huge fan of Gold anyway but I wouldn’t want to stay away from Gold completely. It’s wise to utilize every type of investment, and it seems prudent to me to invest at least 10% of my investment portfolio in Gold so that I stay in the race in case Gold prices shoot up more. Talking about title of this post and looking at present downfall in price of gold i would yes one should really invest in it and its the best time to invest.